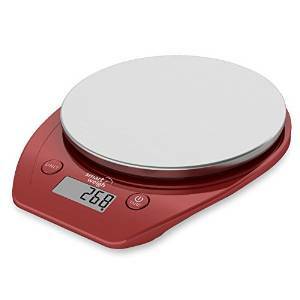 Kitchen scale designed with stainless steel platform, mixing durability and elegance. Large weighing platform with wide weighing capacity of up to 11lbs/5kg. Unit button allows user to easily switch between 6 weighing modes, including water and milk options. High precision sensor system gives quick and accurate readings in oz, lbs, g, ml, fl'oz. 2 AAA batteries included with cooking scale. Weight displayed on large, easy-to-read LCD screen. I have started paying way more attention to how much I eat by logging things into an app. It is the first time I am doing something like this. My goal is of course to get healthy but also to fit more comfortably in my clothes. My goal is small about 1.5 pounds a week but this is proving to be harder then I thought and I think this is because while I never really eat a lot the things I have been eating add up! Since logging and weighing my food, I am definitely seeing where I made my mistakes and how I was so eating too many of the wrong things. 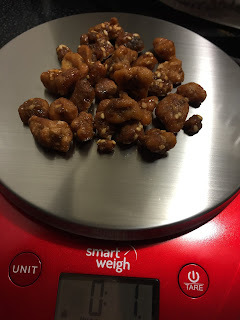 Even my walnuts are being weighed so I can get an actual reading on my food log. 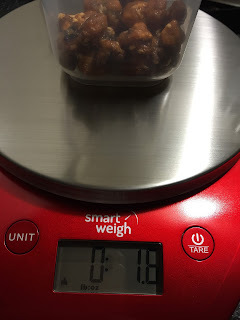 I started out by putting them in my plastic container but decided that I could get more walnuts if I got rid of the holder. My dad is doing the same so I am sending one out to him too. I love it in red! So fun to pull it out and weigh my food before packing it up for the day. You can measure in oz, lbs, g, ml and fl oz. Perfect addition to your kitchen!